With a dozen common varieties readily available, choosing a winter squash to prepare can be confounding for the home cook. We’ve compiled descriptions of common varieties as well as some handy tips for selecting the right squash for you and plenty of delicious squash recipes you'll love. Winter squash are harvested late summer through fall, then “cured” or “hardened off” in open air to toughen their exterior. This process ensures the squash will keep for months without refrigeration. Squash that has been hurried through this step and improperly cured will appear shiny and may be tender enough to be pierced by your fingernail. When selecting any variety of winter squash, the stem is the best indication of ripeness. Stems should be tan, dry, and on some varieties, look fibrous and frayed, or corky. Fresh green stems and those leaking sap signal that the squash was harvested before it was ready. Ripe squash should have vivid, saturated (deep) color and a matte, rather than glossy, finish. This forest green, deeply ribbed squash resembles its namesake, the acorn. It has yellow-orange flesh and a tender-firm texture that holds up when cooked. Acorn’s mild flavor is versatile, making it a traditional choice for stuffing and baking. The hard rind is not good for eating, but helps the squash hold its shape when baked. Selection: Acorn squash should be uniformly green and matte—streaks/spots of orange are fine, but too much orange indicates over ripeness and the squash will be dry and stringy. Best uses: baking, stuffing, mashing. Good for feeding a crowd, these huge, bumpy textured squash look a bit like a giant gray lemon, tapered at both ends and round in the middle. A common heirloom variety, Blue Hubbard has an unusual, brittle blue-gray outer shell, a green rind, and bright orange flesh. Unlike many other winter squashes, they are only mildly sweet, but have a buttery, nutty flavor and a flaky, dry texture similar to a baked potato. Selection: Choose a squash based on size—1 pound equals approximately 2 cups of chopped squash (tip: if you don’t have use for the entire squash, some produce departments will chop these into smaller pieces for you). Best Uses: baked or mashed, topped with butter, sea salt, and freshly ground black pepper. Other varieties: Golden or Green Hubbard, Baby Blue Hubbard. These squash are named for their peanut-like shape and smooth, beige coloring. Butternut is a good choice for recipes calling for a large amount of squash because they are dense—the seed cavity is in the small bulb opposite the stem end, so the large stem is solid squash. Their vivid orange flesh is sweet and slightly nutty with a smooth texture that falls apart as it cooks. Although the rind is edible, butternut is usually peeled before use. Selection: Choose the amount of squash needed by weight. One pound of butternut equals approximately 2 cups of peeled, chopped squash. Best uses: soups, purees, pies, recipes where smooth texture and sweetness will be highlighted. This oblong squash is butter yellow in color with green mottled striping in shallow ridges. Delicata has a thin, edible skin that is easy to work with but makes it a poor squash for long-term storage; this is why you’ll only find them in the fall. The rich, sweet yellow flesh is flavorful and tastes like chestnuts, corn, and sweet potatoes. Selection: Because they are more susceptible to breakdown than other winter squash, take care to select squash without scratches or blemishes, or they may spoil quickly. Best Uses: Delicata’s walls are thin, making it a quick-cooking squash. It can be sliced in 1/4-inch rings and sautéed until soft and caramelized (remove seeds first), halved and baked in 30 minutes, or broiled with olive oil or butter until caramelized. Other varieties: Sugar Loaf and Honey Boat are varieties of Delicata that have been crossed with Butternut. They are often extremely sweet with notes of caramel, hazelnut, and brown sugar (They're delicious and fleeting, so we recommend buying them when you find them!). 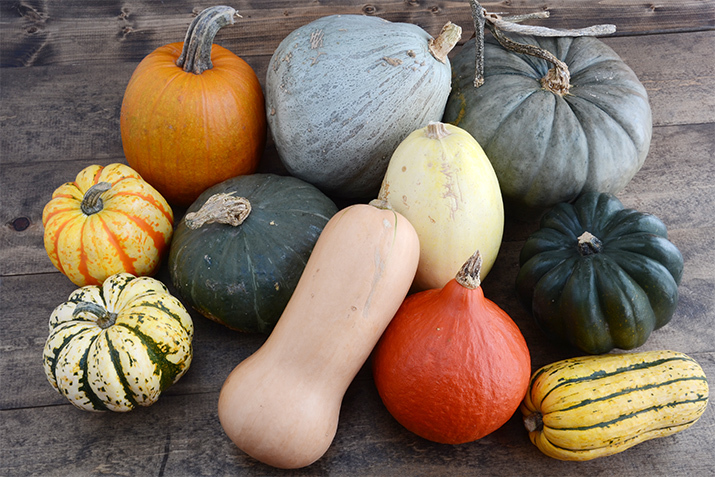 These colorful, festive varieties of squash are all hybrids resulting from a cross between Sweet Dumpling and Acorn, and are somewhere between the two in size. Yellow or cream with green and orange mottling, these three can be difficult to tell apart, but for culinary purposes, they are essentially interchangeable. With a sweet nutty flavor like Dumpling, and a tender-firm texture like Acorn, they are the best of both parent varieties. Selection: Choose brightly colored squash that are heavy for their size. Best uses: baking, stuffing, broiling with brown sugar. Kabocha can be dark green with mottled blue-gray striping, or a deep red-orange color that resembles Red Kuri. You can tell the difference between red Kabocha and Red Kuri by their shape: Kabocha is round but flattened at stem end, instead of pointed. The flesh is smooth, dense, and intensely yellow. They are similar in sweetness and texture to a sweet potato. Selection: Choose heavy, blemish free squash. They may have a golden or creamy patch where they rested on the ground. Best Uses: curries, soups, stir-fry, salads. Other varieties: Buttercup, Turban, Turk’s Turban. Pie pumpkins differ from larger carving pumpkins in that they have been bred for sweetness and not for size. They are uniformly orange and round with an inedible rind, and are sold alongside other varieties of winter squash (unlike carving pumpkins which are usually displayed separately from winter squash). These squash are mildly sweet and have a rich pumpkin flavor that is perfect for pies and baked goods. They make a beautiful centerpiece when hollowed out and filled with pumpkin soup. Selection: Choose a pie pumpkin that has no hint of green and still has a stem attached; older pumpkins may lose their stems. Best uses: pies, custards, baked goods, curries and stews. These vivid orange, beta carotene-saturated squash are shaped like an onion, or teardrop. They have a delicious chestnut-like flavor, and are mildly sweet with a dense texture that holds shape when steamed or cubed, but smooth and velvety when pureed, making them quite versatile. Selection: Select a smooth, uniformly colored squash with no hint of green. Best Uses: Thai curries, soups, pilafs and gratins, baked goods. Other varieties: Hokkaido, Japanese Uchiki. These football-sized, bright yellow squash are very different from other varieties in this family. Spaghetti squash has a pale golden interior, and is stringy and dense—in a good way! After sliced in half and baked, use a fork to pry up the strands of flesh and you will see it resembles and has the texture of perfectly cooked spaghetti noodles. These squash are not particularly sweet but have a mild flavor that takes to a wide variety of preparations. Selection: choose a bright yellow squash that is free of blemishes and soft spots. Best uses: baked and separated, then mixed with pesto, tomato sauce, or your favorite pasta topping. These small, four- to-six-inch round squash are cream-colored with green mottled streaks and deep ribs similar to Acorn. Pale gold on the inside, with a dry, starchy flesh similar to a potato, these squash are renowned for their rich, honey-sweet flavor. Selection: pick a smooth, blemish-free squash that is heavy for its size and is evenly colored. Avoid a squash that has a pale green tint as it is underripe. Best uses: baking with butter and cinnamon. At some food co-ops, farmer's markets, and apple orchards in the fall you may encounter unusual heirloom varieties of squash that are worth trying. If you like butternut, look for Galeux D'eysines, a rich, sweet and velvety French heirloom that is large, pale pink, and covered in brown fibrous warts. You might also like to try Long Island Cheese squash, a flat, round ribbed, beige squash that resembles a large wheel of artisan cheese. If you prefer the firmer, milder Acorn, you might like to try long Banana or Pink Banana squash. If you like a moist,dense textured squash (yam-like), try a Queensland Blue or Jarrahdale pumpkin. These huge varieties are from Australia and New Zealand, respectively, and have stunning brittle blue-green rinds and deep orange flesh. Both are good for mashing and roasting. Interested in exploring how much there is to love about winter squash? Check out our collection of Sweet and Savory Winter Squash recipes and articles.